Bachmann & Scher Wir lieben Uhren". Das ist unser Credo und das Motto, das uns antreibt. Wir lieben nicht nur schöne Uhren sondern auch Uhren mit einer Geschichte, Uhren aus echten Traditionshäusern, Uhren die etwas Besonderes können, Uhren die einzigartig sind. Aber auch Uhren, auf die Verlass ist und die zeitlos sind. Wir lieben es, die richtige Uhr für Sie zu finden, damit Sie sich jeden Tag darüber freuen können. 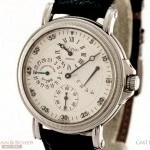 Wir führen die rare, limitierte Sammleruhr ebenso wie Vintageuhren, Klassiker, „New Old Stock“ und gebrauchte, hochwertige Second-Hand-Uhren der Marken Rolex, Patek Philippe, Audemars Piguet, IWC, Cartier, Jaeger LeCoultre, Breitling, Panerai u.v.m. Unsere Top 100 Liste zeigt viele wichtige Uhren, die in den letzten Jahren durch unsere Hände gegangen sind. Unsere fachliche Kompetenz bei seltenen und luxuriösen Armbanduhren der führenden Schweizer Uhrenmanufakturen von 1900 bis heute wird von Uhrensammlern im In- und Ausland geschätzt. Ausführliche individuelle Beratung ist für uns selbstverständlich. Alle unsere Uhren werden von qualifizierten Uhrmachern überprüft und mit einer einjährigen Garantie unseres Hauses versehen. Case material: Steel; Charge: Automatic; Conditions: Never worn Year : 2012; Presentation condition : With dealer guarantee ; Place: Germany, Munich Model: Picot Atelier 1100 $ 2971 Bachmann & Scher Reference: 4029 This is a very good Paul Picot Atelier Régulateur 40mm Ref P7012 20 763 in stainless steel with leather strap and original buckle. Comes with original box and 12 month Bachmann & Scher warranty. 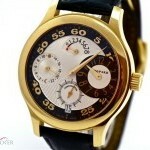 Has got a 925/- solid silver dial and a 22k gold oscillating weight. 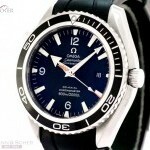 Complicated and very elegant gentleman´s watch! Case material: Yellow gold; Charge: Automatic; Conditions: Never worn Year : 1980; Presentation condition : With dealer guarantee ; Place: Germany, Munich Model: Day Date / President $ 12696 Bachmann & Scher Reference: 18038 This is an excellent Rolex Vintage Day-Date Ref.18038 in 18k yellow gold. Manufactured in the year 1980, this awesome model has got a bronze colour dial with United Arab Emirates Logo in the center. Great and very wanted collectors item with arabic weekday disc! 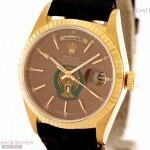 Iconic gentleman´s gold Rolex. 12 month of Bachmann & Scher warranty ! Case material: White gold; Charge: Manual; Conditions: Never worn Year : 1970; Presentation condition : With boxes and all papers; Place: Germany, Munich Model: Captain $ 3417 Bachmann & Scher Reference: 5121 this is a very good chopard lady size 18k white gold manual wrist watch with 18k white gold bracelet. has got original diamond setting on the bezel. typical 1970ies design with no numerls on the dial. 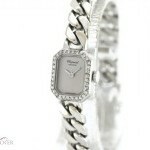 beautiful and elegant lady's gold watch. comes with 12 month of bachmann & scher's warranty! Case material: Steel; Charge: Manual; Conditions: Never worn Year : 1942; Presentation condition : With boxes and all papers; Place: Germany, Munich $ 2272 Bachmann & Scher Reference: nessuna This is a LeCoultre Vintage Pilot Military Watch Mark VII Weems in stainless steel with leather strap. 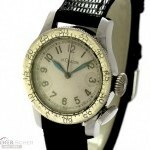 Very first wrist watch conceived for Pilots. The Mark VII, so called Weems, conceived for the US Army and also for the British Army 1940 till 1943. Later on replaced by the Mark VII without any bezel. The name " Weems " comes from its inventor, the American Military Pilot Philip Van Horn Weems, who filed his system in July 23, 1935. Ultra rare collectors item! 12 month warranty from Bachmann & Scher ! Case material: Red gold; Charge: Manual; Conditions: Never worn Year : 1962; Presentation condition : With boxes and all papers; Place: Germany, Munich Model: Portofino $ 3087 Bachmann & Scher Reference: nessuna this is a very good iwc vintage gentleman`s watch in 18k rose gold. 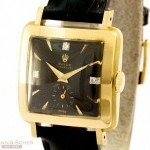 manufactured in around 1962, with a beautiful black dial. dial is restored! 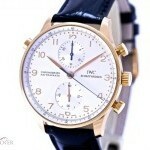 exquisite vintage gentleman's iwc with broad case! 12 month of bachmann & scher's warranty! Case material: Yellow gold; Charge: Manual; Conditions: Never worn Year : 2005; Presentation condition : With boxes and all papers; Place: Germany, Munich Model: L.U.C $ 11473 Bachmann & Scher Reference: 16/1874 this is a very good chopard regulateur l.u.c. in 18k yellow gold and croco strap and 18k yellow gold deployment buckle. 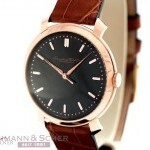 comes with the original box and warranty papers, germany 2005. beautiful and fine gentleman's gold chopard. limited to 250 pieces - this is no. 04x. 12 month of bachmann & scher's warranty! Case material: White gold; Charge: Quartz; Conditions: Never worn Year : 2001; Presentation condition : With dealer guarantee ; Place: Germany, Munich Model: Tank Francaise $ 11531 Bachmann & Scher Reference: WE1018S3 This is a new-like Cartier Tank Francaise Medium Size ref.WE1018S3 in 18k white gold with bracelet. Comes with the original box and warranty papers - Germany, 2001. Has service in 2013. Looks like new ! Current model with original diamond settings on both sides. 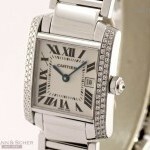 Very elegant and exclusive lady´s Cartier classic ! 12 month of Bachmann & Scher warranty ! Case material: Ceramic; Charge: Automatic; Conditions: Never worn Year : 2013; Presentation condition : With boxes and all papers; Place: Germany, Munich Model: Big Bang $ 12987 Bachmann & Scher Reference: 342.CV.130.RX.114 this is a new-like hublot big bang ceramic, ref. 342.cv.130.rx.114. comes with the original box and warranty papers - germany, munich, nov. 2013. still under hublot warranty until nov. 2015! 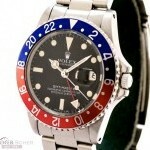 current model with original diamond setting on the bezel! 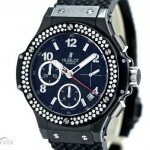 great lady`s sports watch with funky look!